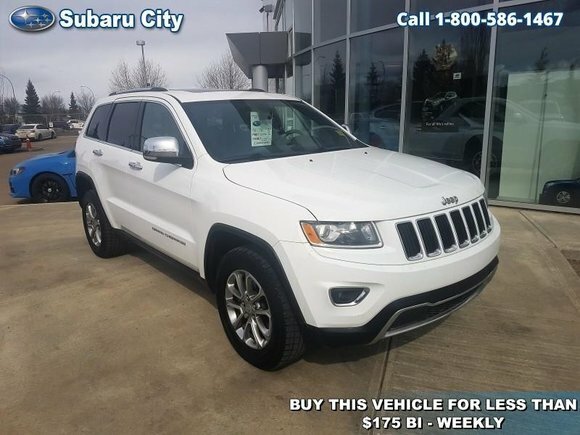 Home > Used Vehicles > 2015 Jeep Grand Cherokee Limited,LEATHER,SUNROOF,BACK UP CAMERA,4X4,CLEAN CARPROOF,LOCAL TRADE!!!! 2015 Jeep Grand Cherokee Limited,LEATHER,SUNROOF,BACK UP CAMERA,4X4,CLEAN CARPROOF,LOCAL TRADE!!!! Cylinders: 3.6L V6 24V MPFI DOHC - 6 cyl. On Sale! Save $1000 on this one, we've marked it down from $24900. This 2015 Jeep Grand Cherokee is for sale today in Edmonton. The Jeep Grand Cherokee is the most awarded SUV ever for good reasons. With numerous best-in-class features and class-exclusive amenities, the Grand Cherokee offers drivers more than the competition. On the outside, it showcases the rugged capability to go off the beaten path while the interior offers technology and comfort beyond what you'd expect in an SUV at this price point. The Jeep Grand Cherokee is second to none when it comes to performance, safety, and style. This SUV has 141342 kms. It's bright white in colour. It has an automatic transmission and is powered by a 3.6L V6 24V MPFI DOHC engine. This vehicle has been upgraded with the following features: Leather Seats, Bluetooth, Rear View Camera, Heated Seats, Heated Steering Wheel, Remote Start. To view the original window sticker for this vehicle view this http://www.chrysler.com/hostd/windowsticker/getWindowStickerPdf.do?vin=1C4RJFBG1FC747079. Buy this vehicle now for the lowest bi-weekly payment of $157.09 with $2593 down for 84 months @ 5.99% APR O.A.C. ( taxes included, $790 Administration and Secure Ride included / Total cost of borrowing $5259 ). See dealer for details. Want to try the 2015 Jeep Grand Cherokee Limited?